So last week I wrote about this year's White Party Manila and expressed my general disappointment with the increasing ticket costs for the street party. I'm still unable to comprehend fully why this is so, and thus the reason for my posting a blog. Since the campaign started, feedback on social media has been mixed and Mentorque Productions, the group who is organizing the White Party this year, has been trying to respond to the criticism in various ways. Guys, for the past years we only aim to deliver the best for everyone who patronizes the events of Mentorque Productions. We are thankful for those who continuously support us. Amidst the issues, we can't please everyone. We have chosen not to speak further on the mudslinging that is happening. We only want to give you the best, and for the upcoming 11th White Party Manila we all have made sure that it will be worth it. Okay, I'll ignore the increased likelihood that this opening may have been meant to be sarcastic with the capital letters. Now that Pride has started to be a celebration rather than a protest. As much as the original Gay Pride coincided with the anniversary of the Stonewall riots, I don't think you could call the annual White Party a protest action either. It has evolved into a celebration of diversity and the LGBT community as a whole. Ticketing and Corporate sponsor is a reality. Commercialization has allowed these events to continue. Both these statements are true. The party of the Post Pride March last December was the party that funded the Lights stage and sounds for the Pride March for Pride March itself lacks Funding. I cannot confirm nor deny this, but to some extent I can appreciate their efforts. However, if the money collected for the Pride March was only meant to cover the costs of the March, that I would doubt at P100 a ticket. It's one thing to support LGBT causes like as an NGO would, it's another to run a major event and aim to make money off of it and just happen to cover the costs for the stage that was also used for their own event. It's not like the stage was meant solely for the March itself, which had ended hours before the party had begun. The First White Party was yes... FREE... For they have generous sponsors... but now No one will just sponsor that much anymore... Have you ask why they stopped? We only receive products for sponsors and go all the way out to convert it to cash so that production cost will be settled. 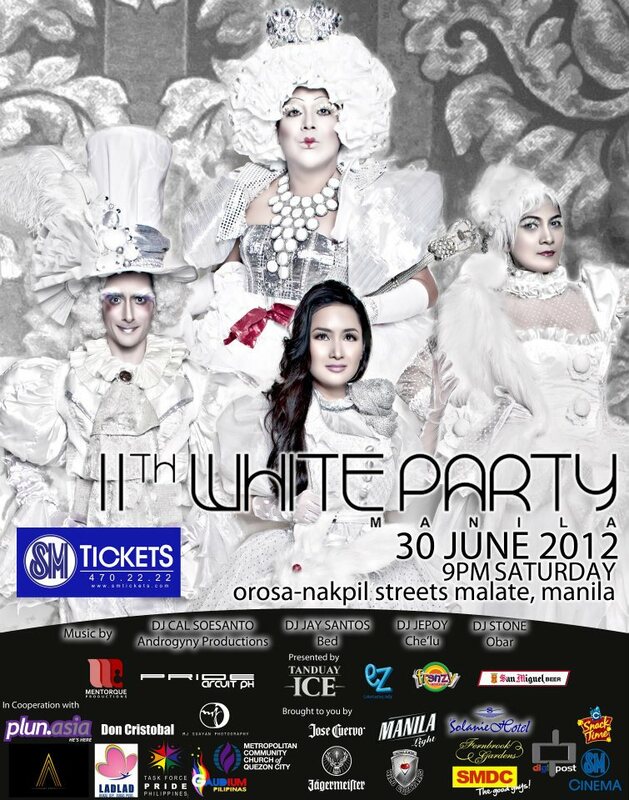 White Party started to commercialized last 2010 because years before that no one is organizing it already. You know why? Corporate Sponsorships are gone. Without the 2010 move, White Party Might be just a thing of the past. The past White Parties were collaborative efforts on the part of the Malate bars working with whoever was organizing at the time. To claim that they were solely funded by corporate sponsorships would be an inaccurate statement. And given what happened last year with the party unnecessarily delayed by then-organizers New Genesis Events Production and Management since it wasn't raining on the day itself and my friends and I were still able to go to Malate and celebrate Gay Pride without the event. And please don't pass the buck to the consumer that your group was unable to get sponsorships. That's supposed to be the bread and butter of any events management group. And if anything, LGBT support is much stronger now than when the party started - I find it hard to believe that companies were all in a hurry to sponsor the first few White Parties given the difference in LGBT acceptance at the time. Mentorque Productions only started getting involved in the Malate street parties with last year's Black Party and again the Pride March. And suddenly they're experts on how to run these events? If anyone would like to volunteer and sponsor these events so that we won't charge any amount to the goers, please tell them to contact us we need them. This is why networking with the community is key and preparations for the White Party start the year before. And beyond that, the party needs to be designed with the funding limitations in mind. Instead, it's clear that the group is over-committing to some grander vision of their own choosing instead of just focusing on what really matters - celebrating Pride. 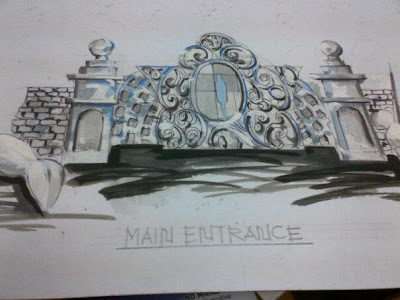 It should be more about the message that you want to deliver instead of creating some faux-impressive event with overly elaborate entrance ways. Seriously, why are we investing so much on an entrance? And what about this weird ad campaign that had to be shot at the Fernwood Gardens? Just look at this - what's the point behind this? Why is this so important? What other frivolities are we spending on? I can't imagine what else the group has come up with to justify charging an arm and a leg to just get into a street party that is supposed to be able freely celebrating pride with the rest of the LGBT community. We hope we come together and celebrate Pride. Nothing will happen if we only exert our efforts on criticizing rather than helping each other out. As a blogger and as an individual, I have every right to express my opinion, especially when I see that we're doing something that misses the point behind Pride and focuses instead on maximizing potential revenue from the event. This isn't a smear campaign or "mudslinging" - this is intelligent critique and creating discussion and discourse about the way this event is being managed! And if this is still supposed to be a "protest" like what was implied earlier in this comment, then since when did we charge entrance for a protest or other political action either? Let's face it, Mentorque wants to make more money from this event. This hardly becomes about celebrating Pride at all. And here we have the obligatory closing to still sound polite. My main point here is this - anyone who takes on the responsibility of organizing events like the White Party should not be out to make money. This is NGO work. This is about giving the community a venue to celebrate who we are, embrace diversity and remind the world that we're a growing segment of the community that deserves better representation. I'm not saying it needs to be totally free - I can accept when the party was a minimal P50 to help recover expenses without turning too much of a profit via the entrance rates. Make money instead on alcohol sales. And don't tell me the performances are paid. The DJs listed all belong to the bars that are already in Malate and are on the payroll of their respective establishments. And any performers should feel honored to participate in the Pride activities. We should only get volunteers who will participate because of the spirit of Pride and at best can be given a small token to show the community's appreciation - or perhaps be given one of those in-kind product giveaways provided by the sponsors that they have. We don't need an elaborate and expensive ad campaign - we should focus on the power of social media and getting the community more directly involved in spreading the word. And most importantly, the event should not lose sight of the fact that we're trying to celebrate GAY PRIDE here. It means that everything about thee event should focus on that goal instead of just being a party. A friend of mine on Facebook mentioned that perhaps we should some trying to challenge the way this event is being run and instead vote with our wallets. If we don't like the event, then we shouldn't go! And as much as I always make it a point to attend the White Party to celebrate Gay Pride with the rest of my friends, maybe it's time I find an alternate venue for this. So that leaves two options - either we celebrate Gay Pride a weekend earlier on June 23 at Malate or celebrate Gay Pride somewhere else on June 30. What do you geeky readers think? How will you celebrate Gay Pride this year?